We started this blog last year in February and learned as we went along. We had no clue what people wanted to read, what information they wanted, and so on. After doing this blog for half a season and then the whole offseason, we've been learning what our readers enjoy, and what makes new readers come to our site. Last year we made at least one post a day, and we hope to do that again this year when the season begins. We've been gaining a following since we started the blog and have done things to make those numbers grow. Our work on this site has allowed us to write content for Juniorhockey.com, which in turn brought us more readers and brought more attention to the best team in the NAHL, the Johnstown Tomahawks. As we continue to operate this site, we try and come up with more exciting content and new features. At the same time we try to post at the same time of day so people know when we have new content. Last year we had a tentative schedule for when we were going to post things, but sometimes we didn't stick to that schedule. Now going into our first full season covering the Tomahawks, and having some competition for readers, we need to set ourselves apart from everyone else. That's what we're going to talk about today. The season is only a few weeks away and we want to go over what you can expect from our blog throughout the season, and when you can except to see new content posted each week. Let's begin. First, here's what content you can expect during the season. We'll go further into the details in a few moments. 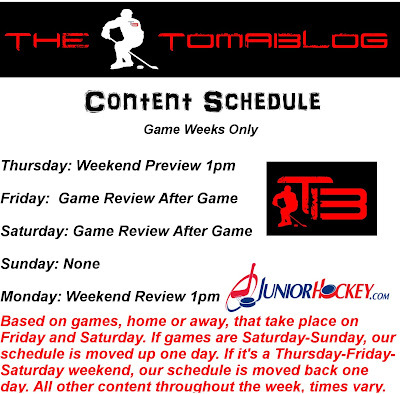 Second, you can see the content schedule we'll be sticking to, throughout the 2013-2014 season. This is something we did last year and never thought we should stop. Before each weekend, we'll preview the match up. We'll have all the stats you could ever need, for not only the Tomahawks but their opponent. We'll have the latest news for both teams, who's in the lineup and who's out. Standings. History between the teams playing. Keys to the game, and much more, to get you ready for that weekend's games. After the game is over, both home and away, we'll have the game recap. We'll have the boxscores, three stars of the game, action photos from Tami Knopsnyder, goal charts, our thoughts on the game, links from the Johnstown Tomahawks, the Tribune Democrat, and much more. During our game reviews and throughout the week we'll keep you updated on the scores involving the other teams in the North Division. As the playoffs get closers we'll go more in depth with our out of town scoreboard so you know exactly what's happening, as teams battle for playoff spots. This is something we did last year from time to time, and we're going to do it again this year. Not every player that starts the season with the Tomahawks will stay with the team. Some might be released, some might be traded, but that doesn't mean you shouldn't know how they are doing with their new team. We'll provide updates on those players all season long. Also we'll check up with players that played with the team last year, aren't in college yet, and are playing elsewhere. From time to time we'll chat with players about the season, what's going on off the ice, their future plans, and much more. Tomahawks make a trade, sign a player, do something in the community, we'll tell you all about it. Since the Tomahawks' now have a few players playing at the college level this season, we'll update you on how they're playing, and we might even have a few interviews with them during the season. This is a feature that will start in the middle of October 2013. Each day we'll look back and see what was going on with the Tomahawks' exactly a year ago to the day. For people that love trivia, you'll love this new feature. At least once a week we'll tell you all the latest news around the NAHL North Division so you'll be up-to-date with all the Tomahawks' rivals. 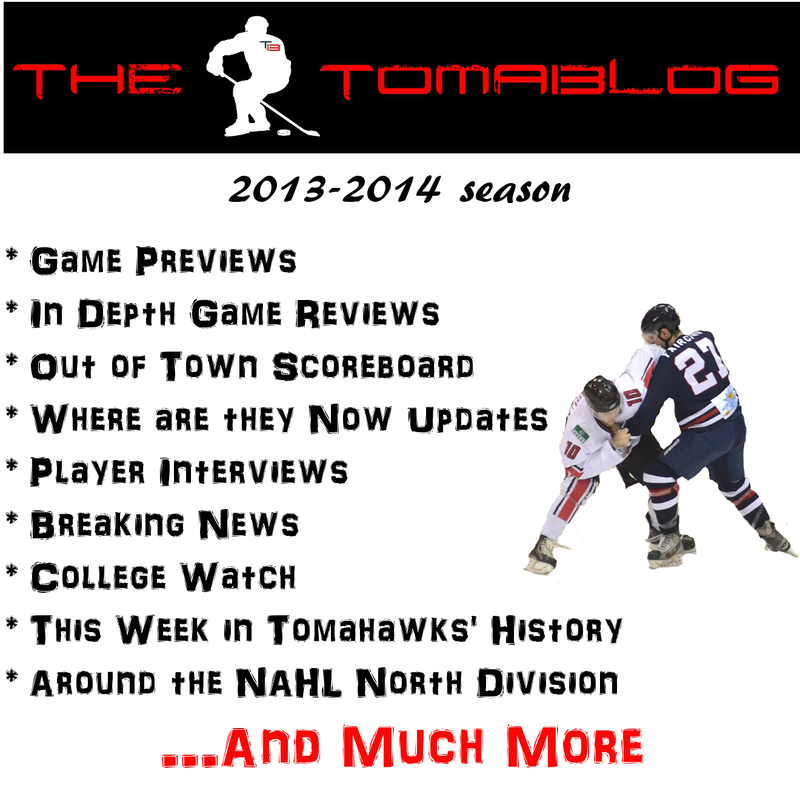 We're still working on all the details for this, but we hope to have either a weekly, or monthly podcast, where we'll talk about the Tomahawks, have interviews with Players and Staff, and much more. When we get everything together we'll let you know. This isn't the only things we'll be doing this year, we also love hearing from our readers on what they'd like to see on the blog, and we'll keep adding new features as the season goes along.